Bears' ninth-round draft pick in the first draft in NFL history. All-NFL his final eight seasons. 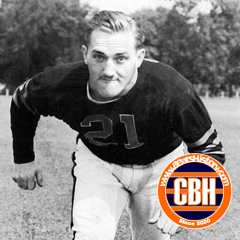 Attended college at Colgate before completing his medical degree at University of Chicago while playing for the Bears. Played guard on offense as well as defensive line. Named to the Pro Football Hall of Fame in 1965. Died in 1995 at the age of 79.